I think my favorite Kyrgyz food is oromo. 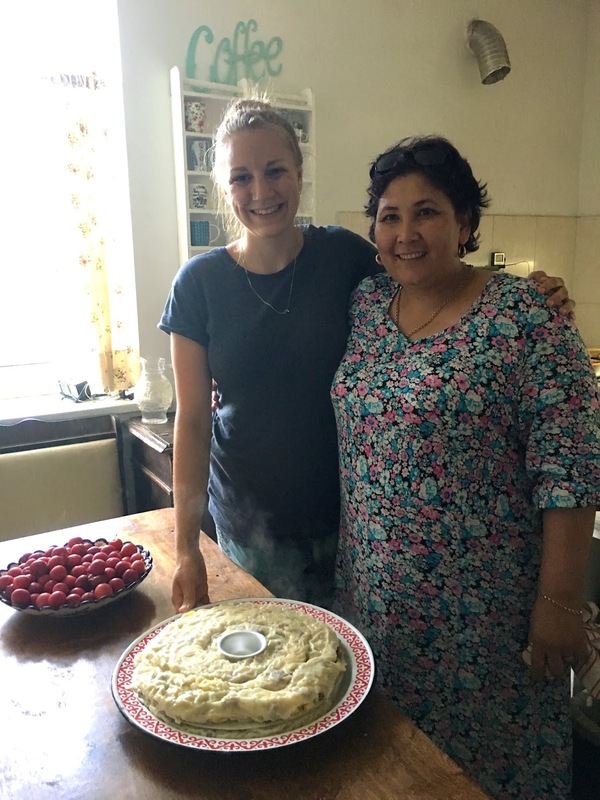 So when Isabel's Kyrgyz teacher volunteered to demonstrate how to make it while our guests were here, I jumped at the chance. Oromo is taaastey. We picked her up at her apartment. She brought her own rolling pin and giant steamer pan. Unfortunately, our water was out that day. Fortunately, we had stored up some reserves. Usually when we have no water, we try to conserve on dishes--sometimes even resorting to flimsy paper plates. Thankfully, oromo-making doesn't require bunches of bowls. Just one--plus a table and a large cloth. "Kelley" is a friendly, take-charge sort of gal. She teaches school to support her family and moonlights teaching Isabel. Oromo lessons were strictly relationship oriented. One Kyrgyz culture lover sharing her passion with eager learners. We, the learners, helped dice potatoes, onions, zucchini, and beef. Then we kind of stood around agog as she whipped out the dough by feel and then rolled it around itself on her meter-long rolling pin. When it got too large for the table, she and Isabel moved it to the floor. I apologize for the blurry quality of the next photo. I could say it was an action shot (which it was) but even the fridge is fuzzy. After spreading the filling, she lifted the cloth, and the oromo rolled up like a magic carpet. She pulled up both sides and sliced it down the center. I so want to try this with cinnamon rolls. Then she snaked the oromo around her steamer pan. And started over. Her steamer has like five layers. The stove steamed up our kitchen for about 45 minutes. After the below shot, Kelley up-ended the finished product onto the platter, and then, with a-one and a-two and a-three, tossed the entire oromo up in the air, flipping it over safely onto the platter again. "Why????" It was so risky. 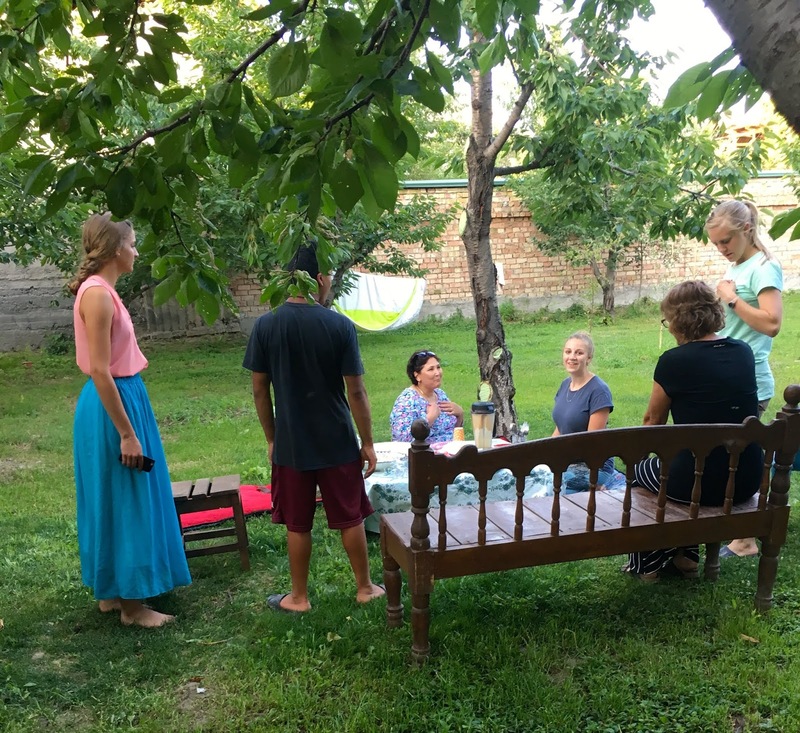 We set up a quick picnic in the backyard because--shade--and called everyone to the table. Theo nabbed a piece of watermelon before we began. I nabbed my favorite Kyrgyz food. It was eye-rollingly delectable. Offset by polka dot paper plates.